My encounters with Afghanistan have, I am happy to say, remained fictional. First, there was Harry Flashman, wrapped in the union jack (he was trying to hide) becoming a hero defending an outpost at Gandamack, after marching with the wailing and terrified exodus from Kandahar. [fraser] Then, there was the flawed but beautiful The Man Who Would be King with Sean Connery and the ever-present Michael Caine as a couple imperialist stooges who make the mistake of believing too much of their imperial ideology. It looks like a beautiful place that I wish its inhabitants enjoyment of, but that’s about it. Now, the US president, a serial draft-dodger, physical and moral coward, appears to have casually written the military a blank check for its activities in Afghanistan. There are so many parallels to what happened in Vietnam that it’s hard to know where to start, though the main one that jumps out at me is force structures. 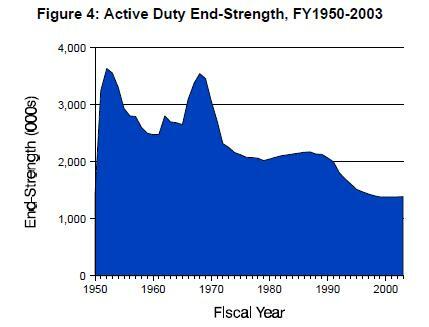 Just to give you some idea how that played itself out, when Robert McNamara took over as secretary of defense, he oversaw the build-up of the military from about 1.7 million active personnel to a bit over 3 million. If you look at the illustration you’ll see the bump in 1950 that was the war against North Korea, and the bump in 1970 that was the war against Vietnam, Laos, and Cambodia. The US military did not have enough troops in Vietnam to win; it’s that simple. It didn’t have enough troops in Korea to win, either. The Red Army, at WWII levels, could have won in either of those places because the soviets could, and would, put 8 million soldiers in the field if they had to. What has changed is the cost of putting high tech troops in the field: it’s egregious. America’s response to the cost of putting high tech troops in the field is: more high tech. It’s a funny response, when reality tells you “your military is not cost effective because it’s too expensive” to commission a research group of expensive consultants to recommend a whole raft of better more expensive widgets, but that’s how we do it. There’s a joke that was going around in military analysis circles that the Rumsfeld Doctrine was “go in with just enough troops to lose” but there’s a truth in that: the military has become so expensive that all they can do is buy more complicated technology and that simply doesn’t square with manpower-intensive counter-insurgency operations. The current darling of the US military is special forces – high tech assassins – because: not manpower intensive but expensive. However, if you think of special forces as human smart bombs – high tech homing/seeking munitions – you’ll realize that they’re going also fail. There is no amount of targeted bombing or targeted assassination that achieves a democratic political resolution. What’s happening in Washington is that it’s really the only card the US has left to play, so, it’s playing it over and over again because the alternative is to leave the table. Sixteen years after its commencement and six years after its cessation, the Soviet-Afghan War remains an enigma for Westerners. Set against the backdrop of earlier successful Soviet military interventions in East Germany (1953), Hungary (1956), and Czechoslovakia (1968), and occasional Soviet military pressure on Poland, the stark military power of the Soviet state seemed to be an irresistible tool of indefatigable Soviet political power. Ever concerned about the specter of a Soviet theater strategic offensive across the plains of Europe, the West was thankful that nuclear deterrence maintained the Cold War balance, and was conditioned to accept, albeit reluctantly, the results of Soviet intervention within its Socialist commonwealth or in Soviet border regions. Having suffered through the trauma of Vietnam, Americans, in particular, watched curiously to see how the vaunted Soviet military machine would deal with the ill-equipped tribesmen of this inhospitable region. A few recollected the Afghan experiences of the British in the late Nineteenth Century, when British imperial power was humbled by the ancestors of these very same tribesmen. Few Westerners, however, doubted that the Soviets would ultimately prevail. Some even projected their European fears to Asia, and pondered the applicability of the Soviet theater-strategic offensive to southern Asia. More than a few strategic pundits and military planners envisioned a bold Soviet strategic thrust from southern Afghanistan to the shores of the Persian Gulf, to challenge Western strategic interests and disrupt Western access to critical Middle Eastern oil. Despite these fears and dire warnings, the Soviet Afghan military effort soon languished as the British experience began to repeat itself. Although appearing to have entered Afghanistan in seemingly surgical fashion and with overwhelming force, the Soviet military commitment was, in reality, quite limited, and the immense and stark territory of Afghanistan swallowed the invaders up. Across the largely barren landscape, guerrilla fighters multiplied, and, within months, the hitherto curious word mujahideen took on new meaning. The anticipated short sharp struggle became prolonged as the West watched transfixed, wondering when the Soviet military machine would prevail. In time, the question of prevalence imperceptibly faded, and was replaced by doubts over whether the Soviets would prevail at all. In the end, ironically, even the Soviets could not cope, and the disease of the Afghan adventure infected Soviet society and the Soviet body politic itself. What began as yet another step in the expansion of Soviet power ended in a welter of systemic institutional self doubt that exposed the corruption within the Soviet system and ultimately brought that system and its parent state to ruin. To this day the Western view of the Afghan War has been clouded in mystery and shadows. Soviet writers have presented Westerners with a mixture of political diatribe, military fable, allegory, and analogy, set against the backdrop of few facts. Westerners have recounted the war based on this Soviet material, sketchy mujahideen accounts, the reports of the occasional Western war correspondents in Afghanistan, and pure supposition. This volume, the first factual material to shed real light on the conflict, represents a unique first step in setting the Afghan record straight. Several stark realities immediately emerge which place the Afghan War in proper perspective and permit its proper assessment in the context of Soviet military, political, and social development. First, although violent and destructive, the war was a limited one, in particular, in comparison with other notable recent local wars. Its ferocity and decisiveness did not match that of the series of short Arab-Israeli wars which scarred the Cold War years. It lacked the well-defined, large-scale military operations of the Korean War and the well-defined political arrangements that terminated that war. It also differed significantly from the oft-compared U.S. war in Vietnam. In Vietnam, American military strength rose to over 500,000 troops and the Americans resorted to many divisional and multi-divisional operations. By comparison, in Afghanistan, a region five times the size of Vietnam, Soviet strength varied from 90- 104,000 troops. The Soviet’s five divisions, four separate brigades and four separate regiments, and smaller support units of the 40th Army strained to provide security for the 91 provincial centers and few industrial and economic installations and were hard-pressed to extend this security to the thousands of villages, hundreds of miles of communications routes, and key terrain features that punctuated and spanned that vast region. Second, faced with this imposing security challenge, and burdened with a military doctrine, strategy, and operational and tactical techniques suited to theater war, the Soviet Army was hard pressed to devise military methodologies suited to deal with the Afghan challenges. Afghanistan aside, the 1980’s were a challenging period militarily for the Soviet Union as it struggled to come to grips with changing political-military and military technical realities. The burgeoning arms race and increasing military strength of western democracies placed undue and unprecedented strains on the already weakening Soviet economy and forced the Soviets to face increased military expenditures at at time when the older policy of “Detente” had increased popular contacts with and knowledge of things Western and raised expectations of Soviet consumers. Soviet military authorities were increasingly unable to cope with military-technical realities in the form of a technological revolution in weaponry, which produced the looming specter of a proliferation of costly high-tech precision weaponry. In the short term, while an economic and technological solution was being sought, the military was forced to adjust its operational and tactical concepts and its military force structure to meet the new realities. Coincidentally, this was done while the military searched for appropriate ways to fight the Afghan War. As a result of these twin military challenges, the Soviets formulated new concepts for waging war in non-linear fashion, suited to operating on battlefields dominated by more lethal high-precision weapons. This new non-linear battlefield required the abandonment of traditional operational and tactical formations, a redefinition of traditional echelonment concepts, and a wholesale reorganization of formations and units to emphasize combat flexibility and, hence, survivability. During the early and mid 1980s, the Soviet military altered its concept of the theater strategic offensive, developed new concepts for shallower echelonment at all levels, developed the concept of the air echelon, experimented with new force structures such as the corps, brigade, and combined arms battalion, tested new, more-flexible, logistical support concepts (for material support), and adopted such innovative tactical techniques as the use of the brone-gruppa [armored group]. Afghanistan not only provided a test bed for many of these lower-level concepts, but it also demanded the employment of imaginative new techniques in its own right. Hence, the brigade, the material support battalion, and the brone-gruppa emerged on the Afghan field of battle, reconnaissance-diversionary [SPETSNAZ] units sharpened their skills, and air assault techniques were widely employed. Third, the inability of the Soviet military to win the war decisively condemned it to suffer a slow bloodletting, in a process that exposed the very weaknesses of the military as well as the Soviet political structure and society itself. The employment of a draft army with full periodic rotation of troops back to the Soviet Union permitted the travails and frustrations of war and the self doubts of the common soldier to be shared by the Soviet population as a whole. The problems so apparent in the wartime army soon became a microcosm of the latent problems afflicting Soviet society in general. The messages of doubt were military, political, ethnic, and social. In the end they were corrosive and destructive. As evidence, one needs only review the recently released casualty figures to underscore the pervasiveness of the problem. Soviet dead and missing in Afghanistan amounted to almost 15,000 troops, a modest percent of the 642,000 Soviets who served during the ten-year war. And the dead tell no tales at home. Far more telling were the 469,685 casualties, fully 73 percent of the overall force, who ultimately returned home to the Soviet Union. Even more appalling were the numbers of troops who fell victim to disease (415,932), of which 115,308 suffered from infectious hepatitis and 31,080 from typhoid fever. Beyond the sheer magnitude of these numbers is what these figures say about Soviet military hygiene and the conditions surrounding troop life. These numbers are unheard of in modern armies and modern medicine and their social impact among the returnees and the Soviet population, in general, had to be immense. That’s from a book called The Bear Went Over The Mountain by Lester Grau [amazon][pdf] It’s an interesting book if you want to study the evolution of Soviet military responses to the tactical and strategic problems they encountered in Afghanistan, but it’s mostly about tactical-level action. If you want to see how the Soviets evolved exactly the same tactics that US troops have evolved, and why, it’s useful. But mostly, it’s painful. There are vast amounts of thoughtful analysis about Afghanistan and the Soviet experience there. 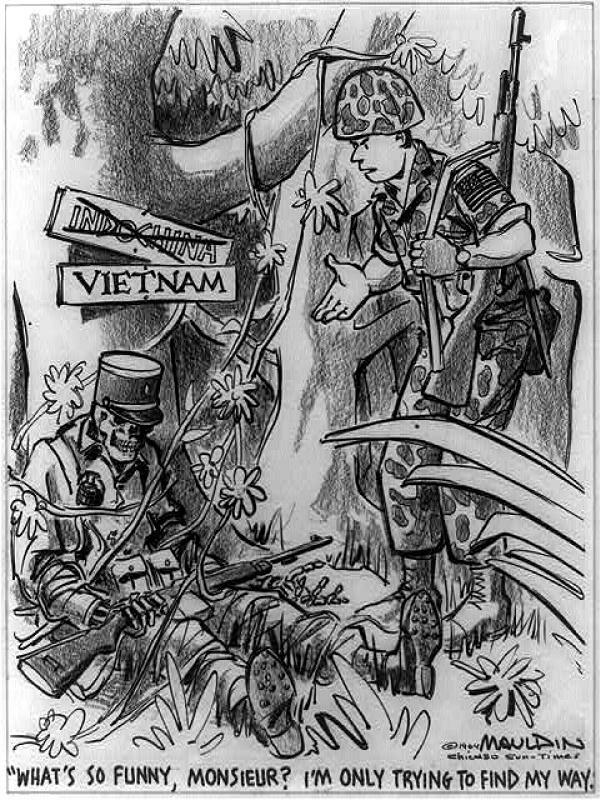 I’m not aware of any that says “we just needed to try a bit harder.” But the Soviet force structure problems, whether it’s brigades or mechanized fire-groups, simply don’t matter in the face of the brute fact that Afghanistan is a lot bigger than it looks – 5 times the size of Vietnam and about as difficult, terrain-wise – and 105,000 troops were probably 1/10 to 1/4 of the force that would be needed to conquer and hold that terrain. The US lost in Vietnam with 500,000 troops, peak, and lost pretty badly. Not as badly as the French, whose peak forces were around 190,000. 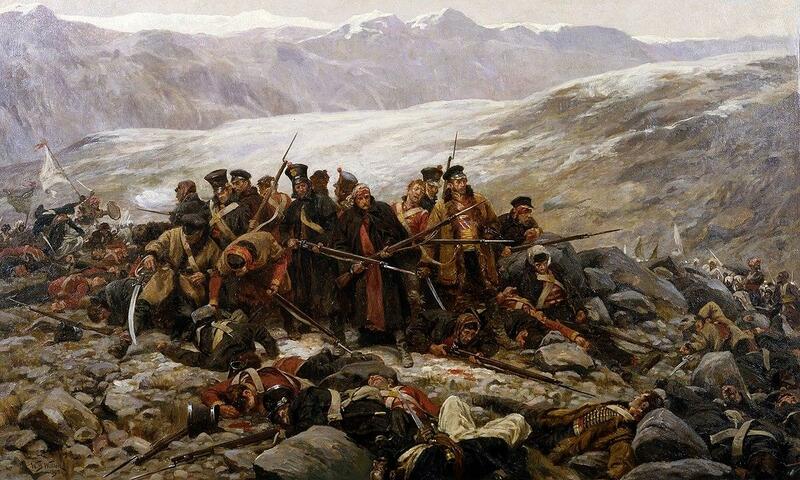 None of the armies that went into Afghanistan, including the British one in 1840, were weaklings that did not know how to fight: they were all imperial forces that were simply not large enough to command that much terrain. The mythology that has risen around colonial military failures revolves around the idea that: 1) “Yeah, but our soldiers are supermen” or 2) “The normal rules will not apply because really, they love us or will come to love us, and 5 guys with a toothbrush could overthrow and pacify them.” The British squandered tremendous numbers of lives at Gandamack, Isandlwana, Spion Kop, and Kut, trying to learn how wrong those ideas are. The French, naturally, said, “here, hold my Pernod…” and proceeded to Algeria and Dien Bien Phu. It’s a sad symbol of the utter failure of US policy elite and its military to come to terms with reality, that we’re even having a debate about Afghanistan today. The US political decision-makers are a great pack of idiots who listen to the US’ professional military who keep selling them on the idea that another 10,000 ‘surge’ in Afghanistan will make a difference to anything but the final body-count of dead Afghans and dead Americans. When you’re losing a war, increasing your forces by 8% isn’t going to do anything. Here is why the US will never win in Afghanistan: to win in Afghanistan, the US would have to re-institute the draft and grow its military to about 4-5 million. Approximately 3 or 4 times its current size. Reinstating the draft would, within 10 years, completely collapse the US establishment’s power structure – the backlash from the lower and lower-middle classes that would be expected to put on uniforms and go fight would be unthinkable. They aren’t that stupid. The establishment, then, will never do that. They aren’t that stupid, either. Therefore, all it can do is dribble in a few penny packets of troops. The US can’t win in Afghanistan without also dealing with Pakistan, and – oops – can’t do that, they’re a nuclear power and we can’t push around a member of the nuclear club especially if there are 3 million American soldiers right next door under their nuclear umbrella. This is not theoretical stuff; it’s obvious features of the strategic landscape. As the author of The Bear Went Over The Mountain argues, the Soviet union helped collapse itself through its involvement in the Afghan war: it was pointless, costly, and brought home broken and doubtful ex-military. In the US, right now, the war in Afghanistan is bringing home broken and doubtful military – ex-military who are trained in violence, and are watching the political turmoil over racist policing and domestic corruption. What will those disillusioned experts in killing do? Sure, some “hearts and minds” will hew to the police and the oligarchy but it’s strategy so bad it’s painful to watch even your class enemies do it. The world has had a disastrous run of American presidents who have consistently arrogated war-making power to the executive branch, away from congress. To be fair, the War Powers Resolution of 1973, overriding President Nixon’s veto, represented an attempt to do that – but congress appears to have decided that partisan bickering and buck-passing is better, writing a Gulf of Tonkin Resolution-style “blank check” to the executive branch in the form of the “Authorization of Acceptable Military Force.” It’s all well and good to say that a drunk’s friends should take their car keys away when they’re leaving the bar, but if it was congress they’d give the drunk a set of keys to a Ferrari. The war was lost before it began. Instituting the draft and growing the military to 4-5 million: at least that’d kill the LCS, Zumwalt, super-carrier navy, and F-35. This is a “boots and rifles” problem not a high tech doodads problem. Donald Trump abandons his years of opposing Afghanistan interventionism because he saw a photo of women in 70s garb. In an effort to help persuade Trump to come to the realization that the country of Afghanistan has a hopeful future, the president’s national security adviser, Gen. H.R. McMaster, showed him a picture of Afghan women in 1972 walking around in miniskirts, according to The Washington Post. The generals originally proposed a plan that would send tens of thousands of troops into the country, but Trump refused to embrace that strategy, according to the Post. Going further back in history, one finds that conquering Afghanistan isn’t actually as impossible as the British and the Soviets make it seem. The Punjabi Sikhs managed to bring the Afghans to their knees in the mid 19th century, although their main goal was to take back disputed border territories rather than to take over the whole area. The Mongols and Mughals under Genghis Khan, Ogedei, Timur and Babur managed it, admittedly through great slaughter on a scale any modern warlord would balk at. Most of the great ancient cities of Bactria were destroyed during these conquests, and the urban culture of late antique Bactria has never been restored. That’s why Afghanistan is predominantly poor and rural to this day. And, of course, the Achemenids under Darius and the Macedonians under Alexander (who became the Seleucids) conquered the region, and settled it with Persian and Greek colonists. To create the high culture and urban centres that the Mongols eventually wiped out (Balkh, Bamiyan and so forth – the jewels of Graeco-Buddhist culture in the East). So what did all these earlier conquerors do that the British, the Soviets and the Americans didn’t? Simple – they settled there. They moved in colonists, built towns and forged links with local chieftains. They married into local dynasties (Alexander the Great’s first wife was a Sodgian princess, the union contracted to seal relations with the peoples of this region. Which was quite a big deal, given that Alexander had avoided marriage well into his late 20s, very unusual for a Macedonian king). Lasting conquest and pacification aren’t about winning wars, they’re about sticking around afterwards and becoming a part of the society yourself. In Afghanistan that’s actually much easier than in most places, because it is so sparsely populated. Unlike, say, Palestine, there aren’t a lot of existing settlements to tread on for a prospective conqueror planning new cities. But the region used to be a lot more populous, so it can support a much bigger population. Trump can’t really do a Genghis Khan, because Genghis himself got there first and the urban infrastructure Genghis destroyed hasn’t really recovered. But he could do a Darius or an Alexander if he could find enough colonists willing to settle the deserts and river basins of the area – either Americans or other displaced peoples willing to do it. Afghanistan’s second-largest city still bears the name of Alexander (Kandahar) – perhaps a Trumpton-on-the-Helmand could be founded to do the same thing, complete with a thriving miniskirt industry. Isn’t American meddling the reason Afghani women are subject to Islamic theocracy today anyways? Like with South America, I was under the impression that a lot of secular, legitimately elected socialist states in the ME were habitually undermined for better trade deals for Murricans. Yep. They were showing their knees. Can’t have that. Afghanistan was a failed attempt at “nation building” (economic colonialism) If you want to see some really interesting stuff about Afghanistan, Adam Curtis’ Bitter Lake will give you a feeling for how ham-fisted the colonial powers have been. I wouldn’t quite characterize Afghanistan as legitimately elected socialists, though – there have been various flavors of dictators since before Ghenghis Khan. The US felt, in the 50s, that some of them were OK. It’s an open question whether they were OK to the Afghanis, or not. My impression is the Afghanis pretty much ignored them as much as they could. Going further back in history, one finds that conquering Afghanistan isn’t actually as impossible as the British and the Soviets make it seem. I became a “peacenik” shortly after I realized that the only successful wars of conquest are genocidal: it just doesn’t work unless you’re willing to kill everyone who might form a resistance. Warmakers that aren’t willing to go that distance will, inevitably, lose unless the conquest appears to be beneficial to the conquered. Genghis Khan, Sargon of Akkad, Chin Shih Huang, etc – being examples of the “successful conquest” technique. The ancients seemed to understand how to do these things: it’s not ethnic cleansing or colonization. The two have to go together. That’s what I don’t understand about Afghanistan – what does “victory” even look like? I get why the US went in – they had to do something after 9/11, or they’d look weak. But I anticipated they’d go in, break some heads, declare “victory” and pull out. I assumed the ongoing failure to find and kill OBL prevented that – while he was still at large “victory” could not be claimed. Then they found him (in Pakistan – doh!) and killed him… and still persisted in Afghanistan. It’s no so much that the US can or can’t win, it’s that as far as I can make out they can’t even define what “winning” means. It’s no so much that the US can or can’t win, it’s that as far as I can make out they can’t even define what “winning” means. Yup! I am equally puzzled. I have no idea what winning means. Nobody seems to. If you really want to be confused, watch Bitter Lake It’s … basically, 75 years of America doing stuff in Afghanistan that we don’t even understand. it’s that as far as I can make out they can’t even define what “winning” means. Didn’t old Freddy say something about gazing into the abyss? BTW, Operation Cyclone, the US/Saudi/Pakistani plan to train, arm, finance, bring in “International” jihadi’ and support the Mujahadeen revolt, started 6 months before the Soviet Invasion. And why were the Mujahadeen revolting, sorry, in revolt? Because the Afghan Government was expanding it’s modernizing of Afghan Society from the Urban areas, into the countryside, with schools, hospitals, roads, women’s rights, etc. Also, the Afghan War was won, and then lost at the First Loya Jurga, when in their rush to invade Iraq, the US put the same Warlords, Druglords and War Criminals back in charge, sidelining the Activists, Reformers and Tribal Elders who wanted real change and reform. The Talib even agreed to sit on the sidelines, so there was a real shot at reform. No idea of the accuracy of the article but the Intercept has one discussing Anand Gopal’s book “No Good Men Among the Living.” that makes the claim that the Taliban tried to surrender but “the U.S. turned them down repeatedly”. And, IIRC, there were reports just after 9/11 and before the invasion saying that the Taliban were willing to extradite Al Qaeda members to another Islamic country if the US supplied reasonable evidence of Al Qaeda involvement in the 9/11 attacks. Given Bush, Cheney, Rumsfeld, etc., I tend to think the story may well be true. That’s one way of seeing it, and it’s probably even how the Mujahideen contextualized it. My guess is that, however, Afghan society was undergoing a power-shift and it was shifting away from the taliban – the American and other investments in dams, schools, industrialization, inevitably had a cumulative effect of empowering the political establishment. Things like women’s rights would become emblematic of deeper social and economic power-shifts and would be hated as such. I’ve always had problems with analysis like “taliban hate people because they are radical islamists” when we’re talking about a culture where a great deal of money is being injected and there’s a culture of corruption. To me it raises flags along the lines of “different power blocs were in line for the corruption $$ and the ones that were left out got angry about it.” Behind all the nation-building and new liberties there are dramatic social changes and new power elites being established. I think the US’ political ideology serves (generally out of blithering ignorance!) to conceal that. I teach British Literature. When we invaded Afghanistan, I put “The Man Who Would Be King” back on the reading list. Hey, if we march into Afghanistan we’ll be welcomed as liberators worshiped as gods! What could possibly go wrong? How many times can we make the same mistakes? Depends on our training-set, apparently. I became a “peacenik” shortly after I realized that the only successful wars of conquest are genocidal: it just doesn’t work unless you’re willing to kill everyone who might form a resistance. It depends on what the goal is. If all you want is to get some gold/oil/luxury goods, then a conquest without a genocide is enough. You just kill all the men in the army (or at least force the army to surrender), and afterwards civilians are forced to surrender their stuff. You take the stuff and transport it to your land. If your goal is to grab some land, then things get messier. Once their army is killed/has surrendered, what do you do with all the people living on the land? The most effective solution is to kill them all (a genocide). Afterwards nobody lives there anymore, the land is free and yours to take. Theoretically there is also another option — assimilation. Just force the conquered people to give up their language and culture and after a few generations their descendants will be obedient citizens of your empire and they won’t even remember that their ancestors were mistreated by what they now consider their own country. Historically there are plenty of examples of successful assimilation, but it often fails. Grabbing some land without killing or assimilating people who live on it is doomed to fail. No country/empire remains strong forever. Empires usually don’t stay strong for more than a few centuries at most. And once the empire becomes weak, people living in formerly conquered colonies decide to leave and make their own separate countries. Knowing that war is a hell for soldiers and civilians alike should be a sufficient reason for opposing wars. At least it is for me. But I also find any reasons for starting a war dissatisfactory. Looting goods or land is not OK. Nobody deserves more oil or Lebensraum at the cost of others. “Bringing salvation to pagans/infidels”, “bringing culture to savages”, “bringing democracy to those oppressed by dictatorships” aren’t reasons for starting a war, they are just excuses. And, theoretically, even if “bringing democracy to those oppressed by dictatorships” was a reason not an excuse, it would be a really flawed reason. For a civilian living under an oppressive dictator a peaceful life is actually preferable to having her home turned into rubble by the bombs of “freedom bringers”. Have you seen the 1988 film The Beast, about a Soviet T-55 which took a wrong turn during their Afghan campaign? The reality of history (with only very rare exception) is that colonial wars only end one of two ways: retreat, or permanent submission (or genocide, re: Tasmania) of the population. The defenders don’t have “home field advantage”, they have their backs against the wall. Occupied peoples aren’t fighting to just win, they’re fighting to exist and will never give up unless they can’t fight anymore. The occupier will never have as strong a motivation unless genocide is part of their planned occupation.